We are interested in using fragment based approaches to develop novel antibiotics for two multi-drug resistant bacterial infections affecting people with Cystic Fibrosis. We are interested in targeting enzymes from Mycobacterium abscessus and Pseudomonas aeruginosa. Mycobacterium abscessus is a multidrug-resistant, rapidly growing species of non-tuberculosis mycobacteria (NTM) which has recently emerged as a major threat to CF individuals and represents the most common and lethal drug-resistant mycobacterial infection in the developed world. 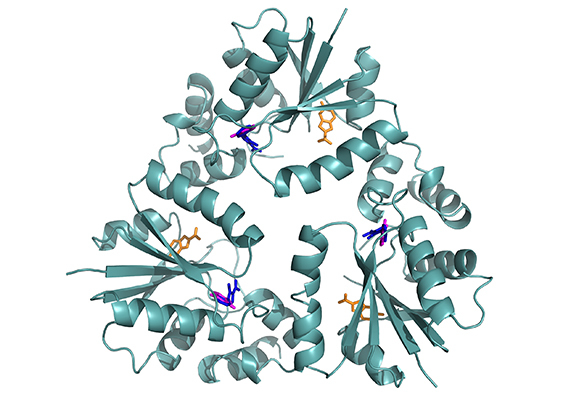 We have successfully begun to apply structure-guided fragment-based approaches to three protein targets of M. abscessus: CoaD (Phosphopantethiene adenylyl transferase), an enzyme involved in the biosynthesis of bacterial Coenzyme A; PurC (Phosphoribosyl aminoimidazole-succinocarboxamide synthase), involved in bacterial de-novo purine biosynthesis pathway and TrmD (tRNA-(N1G37) methyl transferase), an essential tRNA modifying enzyme in bacteria. In parallel to our work in Mycobacterium abscessus we are also employing fragment-based approaches to targeting a number of an enzymes from Pseudomonas aeruginosa. This work is carried out in collaboration with Professor Sir Tom Blundell (Department of Biochemistry), Professor Andres Floto (Department of Medicine, MRC-Laboratory of Molecular Biology) and Professor Julian Parkhill (Wellcome Sanger Institute), Professor Diane Ordway and Professor Mary Jackson (Colorado State University, USA). This research is funded through the Fondation Botnar and the Cystic Fibrosis Trust.